Hillhouse Naturals Autumn Harvested is the best selling fall fragrance. 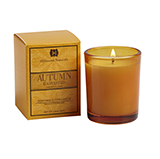 With restorative scents of cider, spiced with nutmeg and ginger, this soy blend votive candle, in orange glass, brings the the relaxing scent of Autumn indoors and will have your home ready for the fall holiday season. Relax and savor Autumn Harvested.